I have plenty of games to keep me entertained. Disasteroids 3d: A fun little 3D OpenGL game that runs and plays great under 95/NT. 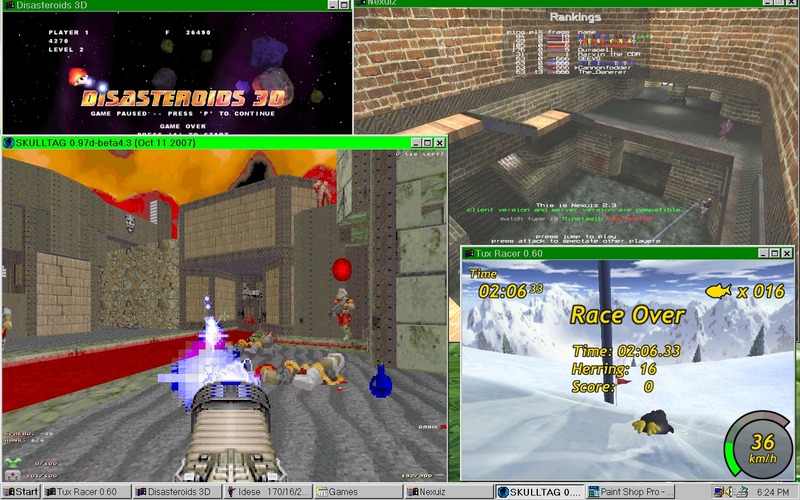 Tux Racer: Both the old Free version and the commercial version run great under 95. Skulltag: Have to edit the skulltag.exe to replace "IsDebuggerPresent" with "ReadFile". Works great in software rendering mode. I have had OpenGL mode working before after disabling some rendering features but software rendering is more reliable (and for me faster too). 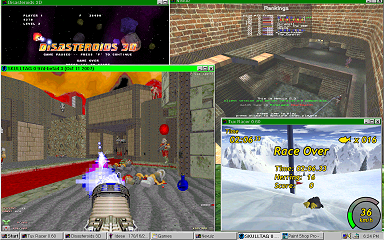 Nexuiz: The non SDL version runs and is playable. I did run in to a small issue with the non-SDL version not being able to play sound effects that were encoded in OGG format (a number of them are). I extracted the data file (it's just a zip and the program can read the files from a folder unzipped) and converted all OGG files to WAV except for the soundtrack files. The soundtrack files are huge WAV files and Nexuiz tries to load all of the sound effects entirely in to RAM. Civilization 3: Picked up a new copy for cheap recently, says right on the box that it works on 95 so I had to get it. Very fun and very time consuming. Return to Castle Wolfenstein: Also designed to work on 95, runs great but I never really got "in" to the game itself. Windows 95 running on a 500 Gigabyte hard drive! According to MS the maximum limit for 95 is 64 gigs. To partition the drive I used the version of FDISK from a downloadable update intended for Windows 98. And just to think, my very first hard drive was 5 MEGABYTES! Oh, and I'm using it with a USB scanner, a USB flash drive, and a USB camera that can take pictures and video. Damn it, I keep doing the impossible. Again, to get a resolution of 1680x1050, replace "1440,900" above with "1680,1050" and use the timings "2256,1784,1968,1087,1051,1054,4,147140000,6000,8,29926"
11: Checksum (all proceeding numbers added together, but ignoring last 4 zeros of pixel frequency). If the checksum is wrong, the driver will ignore the specified timing and use the closest default timing built in to the driver. With this information it should be possible to build timing settings for the 3dfx Voodoo driver for any other resolution out there. This information is also applicable to the Windows 2000 / XP 3dfx Voodoo driver. 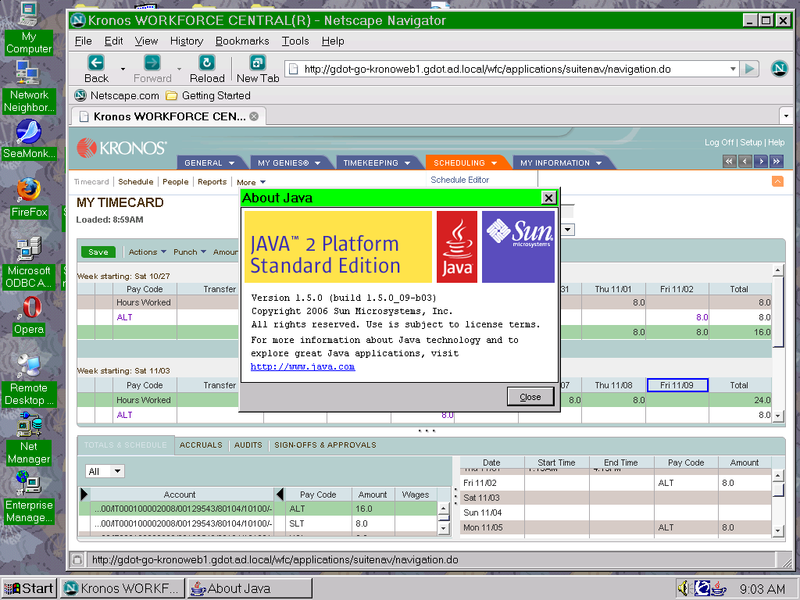 I recently had a need to install the Java Runtime 1.5.0_09 under NT 4. I discovered that the most recent version that installed without any problems was 1.5.0_05, but later versions had problems installing. Install JRE 1.5.0_05, make a copy of the RegUtils.DLL. Uninstall JRE 1.5.0_5. Use a hex editor to replace all instances of _05 with _09 in this file. Copy the RegUtils.dll in to "C:\Program Files\Java\jre1.5.0_09\bin" (create folder if needed) and set permission the same way. Run the JRE setup program, jre-1_5_0_09-windows-i586-p.exe. When the installer says it can not write to RegUtils.dll, click "ignore". Once the installer is done, open Firefox and check that the plugin works. 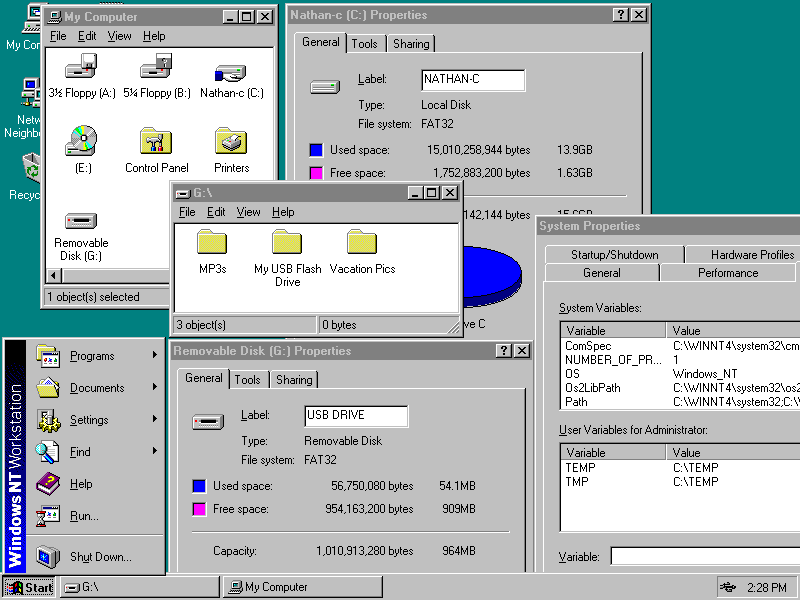 The most recent version I was able to get running properly under a copy of Windows 95 was JRE 1.5.0_05. But this only worked after IE 5.5 was installed. I have not narrowed down specifically what IE DLLs are needed. I tried installing JRE 1.5.0_06 and 1.5.0_09 using methods similar to above, but with no success. 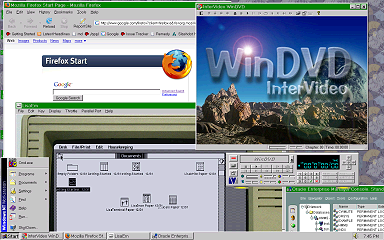 JRE 1.4.2_xx runs happily under Windows 95 without IE. I am currently using 1.4.2_15. 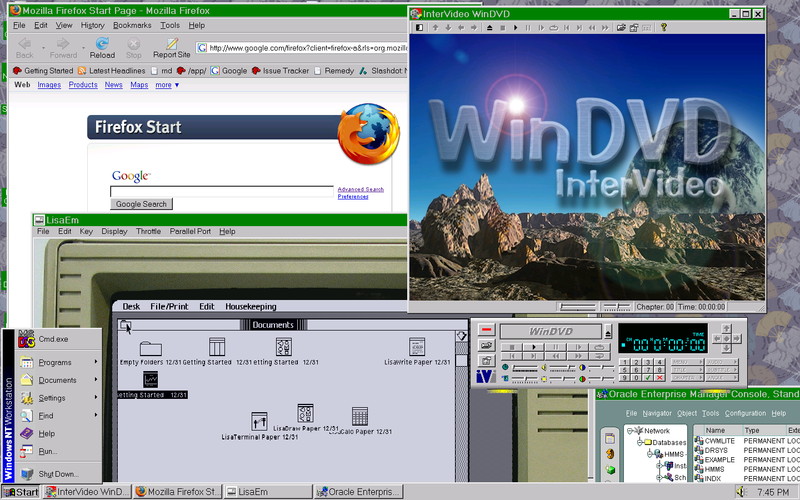 Also, notice that Netscape 9 appears to run well under NT 4. 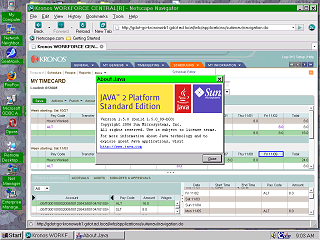 It is based on Firefox 2, that is designed to work on NT 4. Netscape 9 no longer includes the IE-tab like feature that required IE, so it runs happily with no version of IE installed. And check this out! NT 4 booted and running on a FAT32 drive! And talking to a USB flash drive! Optionally Install Windows 9x/ME if desired for dual booting. Install Windows 2000 in a separate folder. You now have a boot loader that knows about FAT32. Install the FastFat32 driver from here under NT 4. Convert the drive to FAT32 using your favorite partition manager and optionally resize it to make it larger. Reboot and select NT 4 - IT STILL BOOTS! 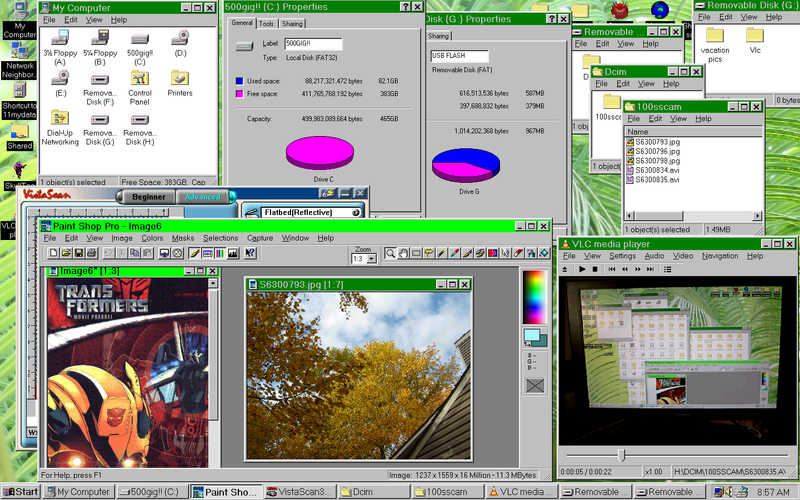 Optionally delete the Windows 2000 folder if you didn't need it for anything else. 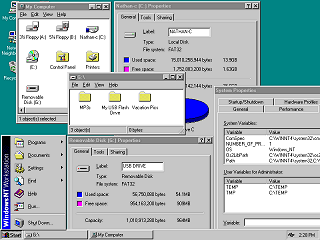 Other methods could involve using a boot sector manager to install the Windows 2000 boot loader, and unzipping/copying an existing minimal NT 4 install on to an existing FAT32 drive. If you don't want to touch the existing boot sector on your hard drive you can also use a Windows 2000 boot floppy disk. Have not tested with with the Windows XP or Vista boot loaders. The USB stuff is simple. Install the USB driver from here(It is bundled with some camera utils, you don't need that part). May not work with all USB chipsets.